Tomatoes! From plants bought at the Ashland Garden Club Plant Sale in May. How to germinate seeds in paper towels. A great way to identify viable seeds. CORVALLIS, Ore. – Is this dry winter making you anxious to dig in the dirt again? There’s some good news if you garden in western Oregon and are an optimist. Cool-season plants can be directly seeded into the ground in March in the Willamette Valley and southern Oregon , said Bob Reynolds, the Master Gardener coordinator for the Oregon State University Extension Service in Jackson and Josephine counties. Cool-season crops include peas, arugula, carrots, cabbage, cilantro, fava beans, kale, kohlrabi, spinach, chard, turnips and lettuce. Reynolds said he’s getting questions from the public already about when to start planting and how to tell when soil is ready. Reynolds recommends using a soil thermometer to check your soil temperature to decide whether to dig in. Soil rather than air temperature is the bellwether of whether to plant, he said. Seeds such as peas will germinate at an average soil temperature of about 50 degrees. Each species has different temperature requirements for germination. Generally, cool-season plants can survive air temperatures as cold as 28 degrees, Reynolds said. Cover the new plantings with clear plastic to protect the soil from getting too saturated by rain. Snow provides a nice incubator for new plants, acting as a blanket to keep the coldest air from penetrating, Reynolds said. You can start hand weeding any time. Wait until plants have established themselves before fertilizing them. As for gardeners in central and eastern Oregon , they’re going to have to be patient. Direct seeding for cool-season crops is not possible until late April or May, said Amy Jo Detweiler, an Extension horticulturist in Redmond . Seedlings can be transplanted in May and June. “We tell people that March is a good time to clean and sharpen your garden tools and take care of your houseplants,” Detweiler said. March is also a good time for high-desert gardeners to study seed catalogs and prepare seed tapes. Seed tapes are good for plants that require thinning, such as radishes. To make a seed tape, cut a 2- to 3- inch strip the length of a newspaper or use tissue paper strips, 2-3 inches wide and however long you need it, Detweiler said. When it’s time to plant, bury the seed tapes in the soil at the seed appropriate depth and the tissue paper or newspaper will break down into the soil, Detweiler said. It’s time to get your greenhouse ready for planting! Start with cleaning the shelves using 1 part bleach mixed with 9 parts water. Sterilize your trays & pots with this same bleach solution. Purchase or make your seedling mix (which is a soil-less mix), gather your plant labels & permanent markers and you’re ready to plant. To calculate greenhouse planting start dates, check each seed packet and plant according to the instructions. Count back the weeks needed for seeds to grow and when you want them really for the garden club’s plant sale or to plant in your garden after the last frost. Seeds typically need 8-12 weeks to grow. For example: AGC’s plant sale is May 11 2013, 12 weeks back from May 11th is February 16th, 8 weeks back is March 16th . Check your seed packets for start dates. Below is a list of flowers you can start in your greenhouse in February: Petunias, Impatiens, Lobelia, Lupine, Echinacea, Rudbeckia, Coreopsis, Salvia, Lavender, Scabies, Delphinium, Pansies, Shasta daisy, Forget-me-nots, Gaillardias, and Nasturtiums. 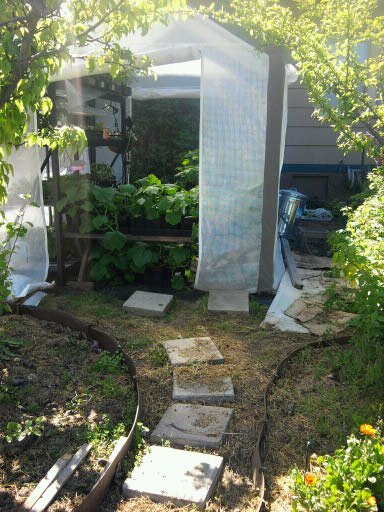 You can also start: Cabbage, Broccoli, Cauliflower, Brussels Sprouts, Beets, Lettuce, Cilantro and Spinach seeds. It is recommended for larger vegetable seeds, like beets, to soak them 12 to 24 hours before planting. To begin: fill your sterilized trays with seedling mix, water the seedling mix thoroughly, and then let them sit until the next day to warm up. On day two, plant your seeds, mark your trays/pots, then water them in. You can provide warmth with heating mats (available at garden supply stores) which sit under your seed trays or you can warm your greenhouse with a portable heater. Some seeds also need light to germinate, so place trays a few inches below a grow light or a florescent light, and keep the lights on 24 hours a day. After the plants have developed several sets of true leaves, transplant them into sterilized pots with a good garden variety potting soil. To avoid transplant shock water them in with a B1 solution; B1 is available at garden stores. Once plants are established in their new pots, fertilize them once a week with a 1/4-strength water-soluble fertilizer. During the rest of the time use plain water; keep the seedlings moist, but not wet. Keep plants under the lights, keep them warm and watch them grow!